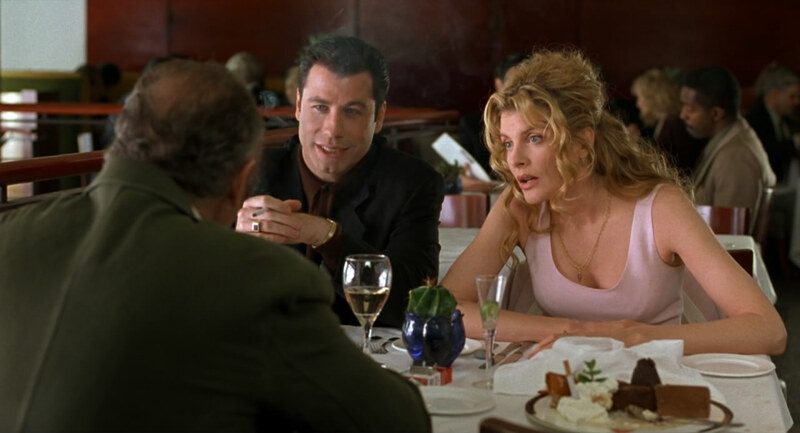 A comedy gangster thriller, Get Shorty throws everything at the screen with plenty of attitude, but finally gets muddled enough to lose its own vibe. Chili Palmer (John Travolta) works as a collector on behalf of loan sharks, and manages to insult Miami Beach mobster Ray "Bones" Barbone (Dennis Farina). But when Chili's boss Momo dies suddenly, he finds himself employed by Bones, and his first assignment is to track down dry cleaner Leo Devoe (David Paymer) who owes Bones money and has committed insurance fraud. Chili tracks Leo from Las Vegas to Los Angeles, and along the way picks up another assignment to collect an outstanding loan from Z-movie producer Harry Zimm (Gene Hackman). Zimm is dreaming of producing a big-league script, and is using starlet Karen Flores (Rene Russo) to try and get her former husband and movie star Martin Weir (Danny DeVito) interested in starring. Chili is a fan of films and fancies himself as a producer, and starts to sweet-talk his way into the deal. Meanwhile Zimm has big problems with limousine company owner Bo "Cat" Catlett (Delroy Lindo) and his henchman Bear (James Gandolfini), a veteran stuntman. Zimm owes Cat money for an unproduced film, and Cat wants to either collect or get a cut of Zimm's new project. Cat himself is tangling with Colombian drug lords, with a $500,000 payment from Cat to the Colombians sitting in an airport locker, under the close scrutiny of federal drug enforcement agents. An adaptation of an Elmore Leonard novel directed by Barry Sonnenfeld, Get Shorty has obvious intentions to build on the success of 1994's Pulp Fiction. With multiple overlapping story lines, a script more witty than real, Travolta in fine form as a likable criminal and violence never far from everyone's mind or intention, Get Shorty lines up all the requisite elements. The film is fun, sharp and exudes a confidence that mostly comes from the attractively hip and uncommonly cerebral Chili Palmer character, but it's also a film too packed and too short for its own good. The Scott Frank screenplay takes plenty of shots at the movie industry, including the running theme that nobody seems to care enough to actually read the much coveted script of Zimm's dream project. Chili has his own story in mind inspired by the fugitive Leo, and he seems to assume that as a self-appointed producer, his thoughts will work their way into the script. Get Shorty eventually buckles under its own weight. Bette Midler makes a rather late appearance as the widow of the screenwriter, Colombia drug lords enter the picture, Bones makes his way to Los Angeles, people start getting beat up while other characters die untimely deaths, and rather than driving towards a satisfying ending, the film gets away from both Sonnenfeld and Frank. The ending is abrupt, almost as if the money ran out, leaving story debris scattered all over the place and sacrificed for the sake of a cheap laugh. While Travolta is smooth, Hackman, DeVito, Russo and Midler play their roles almost strictly for dry laughs. 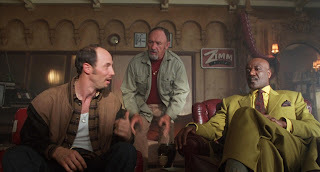 Lindo and Gandolfini go the other way but reach the same destination, hissing with intensity that borders on comical. Moderately amusing, Get Shorty is ultimately overstuffed and truncated.